Space-intensive growing systems are a great concept, but they're so expensive! Who can afford to buy strawberry towers or special planters? They often cost 3-5$ PER POCKET! We think that's ridiculous, when you can make them yourself in an hour or two, for a few PENNIES per pocket! This video shows you how to do that. We recycle 55-Gallon drums, used 5-gallon buckets, 30-gallon barrels, even 300 gallon containers - and an average 55-gallon drum can hold 72 plants in the sides alone - plus another dozen on top! Considering a typical barrel costs less than 10$ used and will last for decades, takes between 1-5 hours to modify depending on your skill with tools and how many you're making at once... this is one of the most cost-efficient, space-efficient, and practical ways of growing ever conceived! 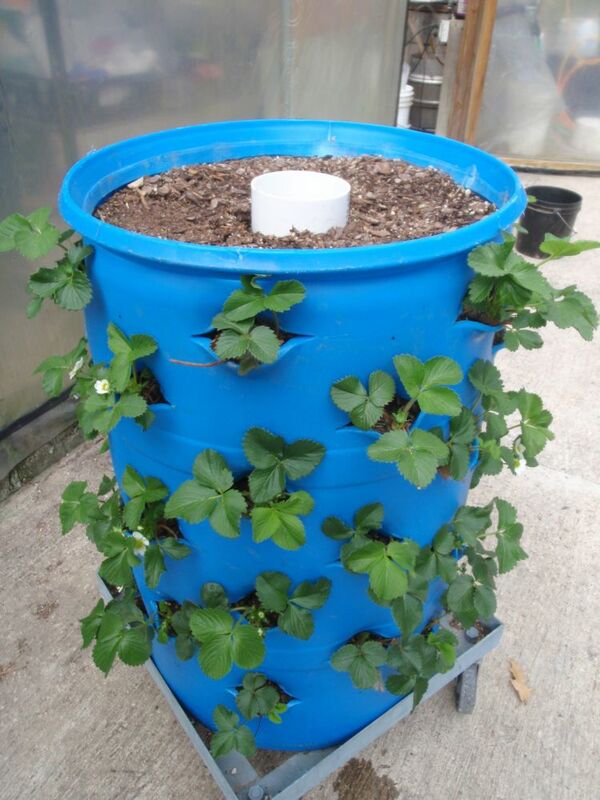 One barrel can be virtually an entire garden in itself - plant the sides in strawberries, lettuce, potatoes, herbs, carrots, beets, and hundreds of other plants, and a tomato and pepper in the top! Our 1-hour video and 16-page booklet shows you the process from start to finish - selecting the barrel, making the pockets, setting up a manual or automatic watering system, mixing the fertilizer, planting, harvesting, maintenance - everything you could possibly need! 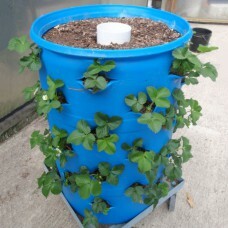 They are very easy to build, requiring only a basic knowledge of tools, and they require only the floorspace of the container you use - for a 55 gallon drum it's about 10 square feet, for a 5-gallon bucket that's a little over 2 square feet, and a typical bucket holds a little under 20 pockets and another 6 plants on top! We have never shown anyone these gardening systems in our own greenhouse who wasn't blown away by them, so we're sure you'll like them too - they are simply stunning when loaded with produce!